User onboarding starts even before your product. It's your acquisition as well. Your advertisement, your SEO, your partnerships. Every way for a customer to discover your product is the beginning of user onboarding process. If your acquisition works then potential users while searching for a solution to their problem coming to your product. Your goal is to prove to them that your product is exactly what they're looking for. To overcome those barriers and successfully convert potential users to engaged, satisfied users you need to master your onboarding process. Let's first look at some examples of a successful user onboarding and then analyze the common elements that make those onboardings successful. Samuel Hulick, the creator of the site, has torn down a lot of successful products to decode their onboarding processes. Everyone who's reading your advert or arrives on your page should immediately see and understand the value your product provides. Your tagline should be crystal clear, short and simple to understand. It should communicate the value your product provides which is consistent with the problem your potential users need to solve. Avoid using acronyms and specific vocabulary that your potential users might not know. Remember about information architecture and make sure the most important copy is the most visible as well. In the case of Duolingo, Basecamp and Slack we see how successful products let users learn them by doing stuff. It's not a tutorial, it's a real product and its interface explains itself. There is no better example of the first class onboarding when the product explains itself in the process of working with it. Even if your product is the best thing out there - the first usage of it might be challenging. People are usually quite careful and unwilling to try new things. Just because they are new. New means learning. Learning makes the brain work. Who likes to work? Positively reinforcing users who are using your product for the first time is a good idea if you want them to successfully onboard. All those progress bars, confirmation messages, tick boxes and smiley faces. All those things to tell the user: "You're doing great. Keep on going!". Advanced tip: Make use of the endowed progress psychological effect. The best products are not asking users to register straight away if that is not absolutely necessary. Much better idea is to give user a possibility to use the product a bit. See for himself the value it provides and only then when some effort already invested, ask the user to sign up. Duolingo nailed that approach. Advanced tip: make use of loss aversion psychological effect. Your potential user should have no doubts about what to do with your product. Ideally, you'd have one major and clear call2action. If you have more than one they will almost always "fight" for attention. Choosing that way still make sure that there is one, main, clear and simple to follow call-to-action. Avoid just icons for call-to-actions. Even if you believe they are self-explanatory, it might not be the case for your users. Brain cycles is a scarce resource nowadays more than ever. Trying your product potential users might have a hundred things on their mind. You cannot expect users to clean the head and solely focus on your product. This means you need to aim for the simplicity. Everything that could be made simpler should be made so. A user shouldn't be forced to guess. A simple example is the password rules. How often we need to guess what the rules are before we insert a password? Or even better, before we try to submit the form? This trivial UX mistake might have a major impact on your onboarding experience. How often have you seen that? Your first product experience starts with an extremely "positive" messages such as you don't have any friends yet, no one following you, no messages, no data available, zeros, zeros, zeros... What could be more discouraging during the first experience than that? Avoid showing zeros as much as you can. Basecamp did it neatly. They could have just said: you have no projects yet. Instead, they created a sample project where a user can see, interact and learn most things needed to accomplish their goals in the product. 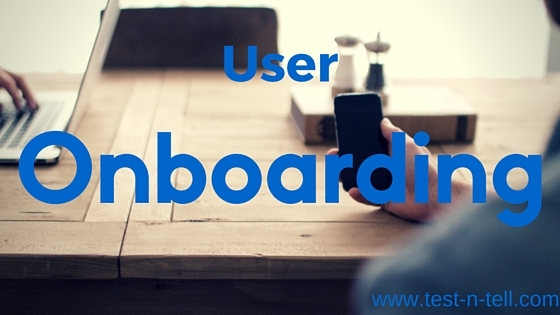 Effective user onboarding process is the key element of any successful product. It starts with potential users acquisition and ends when users successfully adopted your product. Best onboarding experiences let users learn the product by using it. They use clear, understandable and human copy. Users don't need to think too much when using a product. It is simple, solves the problem and pleasant to use.